As the Packers pulled away, Aaron Jones came more and more into the contest and took the game further away from the Falcons. His 29-yard touchdown run maximized the blocking from his offensive line and combined it with his elusive running in the open field to help seal the game for the Packers. Kenny Clark missed time in this game due to injury, but he was still a disruptive force in the middle of the Packers’ defense. His stat line won’t say much, but turning runs away from the intended point of attack and bringing the pocket into Matt Ryan‘s face was a consistent theme of Clark’s afternoon. Bashaud Breeland turned in the starring role in the Packers’ secondary, breaking up and intercepting more passes than he allowed to be completed into his coverage. His pick-six stunned the Falcons in the second quarter, and he didn’t let up from there, as his tight coverage resulted in multiple pass breakups. It was a strong outing for Aaron Rodgers and the passing game, which was only marred by two potential turnovers that he got away with. Rodgers’ best throw of the game came on the double move touchdown to Randall Cobb early in the third quarter, with Davante Adams snagging his other score early in the game. The Falcons got off to a hot start with the help of some tight reviews on contested catches to Julio Jones, but the passing game struggled from there on until the game was done. The Packers let the Falcons have their completions on short passes, but intermediate and deep targets were a no-go for Matt Ryan, and the Falcons struggled to get their momentum back after Bashaud Breeland’s pick-6 that put the Falcons in a two-score hole in the second quarter. Tevin Coleman and Ito Smith were both productive on the ground, averaging a combined five yards per carry on 21 combined carries. There’s no bell-cow back in this backfield, but each showed the vision needed to find the creases in the Green Bay defense along with the agility to break tackles. These two just couldn’t be leaned upon to pull the Falcons back as the Packers pulled away on the scoreboard. Two of the top young defensive tackles in the NFC had strong showings in this one, with Grady Jarrett attempting to go play-for-play with Kenny Clark on the other side. Jarrett’s best plays came early in the game, giving Lucas Patrick fits in the opening exchanges. His disruption lessened as the game went on and the Packers’ lead extended, but this was another strong performance in another exceptional season for the former fifth-rounder. It was a strong day for Deion Jones in coverage with two pass breakups, but it could have been so much more for him and the Falcons, as both of those pass breakups could have resulted in a turnover. 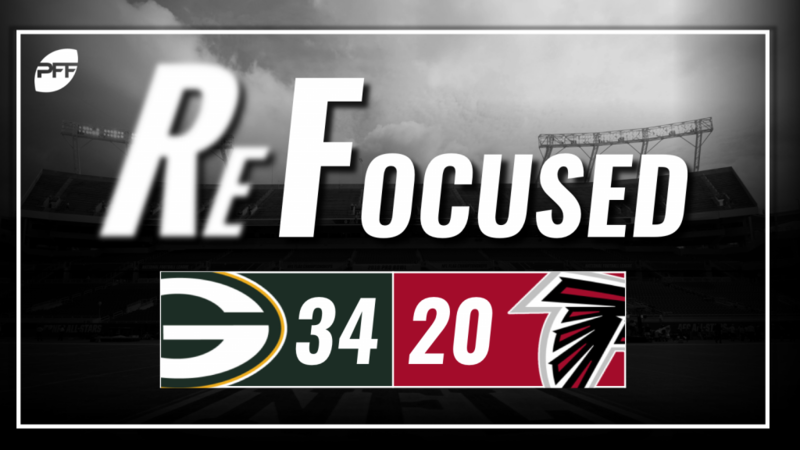 Green Bay: The Packers were unlucky on reviews on the Falcons’ opening drive, but that nature of contesting every throw down the field remained, as their offense put on the points to get away. Atlanta: The Falcons got off to a hot start, but they ultimately couldn’t keep up with Aaron Rodgers and the Packers’ passing attack.